This is a classic drugstore bronzer with great pigmentation and a natural looking finish. It's a warm matte brown and complements lighter skin tones very nicely. If most bronzers are too dark or too light for your skin tone, try using a regular matte face powder in a shade or two darker than your natural colour to give a hint of depth to the face. This is a very intensely pigmented concealer, which covers up imperfections with ease. See a more in depth review and demo in this post, on how to cover a blemish. The Essence eye shadow quads are a great, new drugstore find. Essence cosmetics are very inexpensive and perform quite well for the price. This is the perfect all-in-one palette since the darkest brown can work as a brow powder and the lightest shade could be used to highlight the skin. Once again, Wet n' Wild steals the show. Their eye shadows have amazing pigmentation, many of them being MAC dupes. Buy every single palette, if you can. Hands down best basic pencil liners ever. Creamy, smooth, long wearing and easy to sharpen. I only wish they would make more colours. This stuff is the best foundation ever. It's amazing for special events and photography since there is no shimmer or sunscreen in it to cause a ghostly flashback in pictures. This foundation is long wearing and natural looking on both dry and oily skin. See my full review and swatch here. Rimmel makes some great products, this makeup artist favourite being one of them. This is just a simple, smooth pressed powder which controls shine and sets other products without creating a caky look. Just superb. For the days when my lashes don't require the hold of a waterproof mascara (CoverGirl LashBlast is the way to go for that), L'Oréal Voluminous gets the job done. It'll blow most high-end mascaras out of the water with its classic brush and gorgeous fluttery effect. I have 5 of these glosses. That's how much I love them. Revlon lip products are the best in general, whether it's their lipsticks, lip butters or glosses. This product in particular is so comfortable on the lips, doesn't get super sticky, has amazing pigmentation, lasts a good amount of time, smells and tastes fine, and doesn't dry out the lips. No more praise necessary. This might just be my favourite makeup product of all time. Said to be a dupe of the YSL Touche Éclat, Rimmel's Match Perfection is an amazing under eye highlighting concealer. I wanted to include this product in addition to the Hard Candy concealer since this one is not the best for covering troublesome spots. You don't typically want to draw attention to any raised blemishes on the skin by highlighting them with a light and slightly shimmery product. 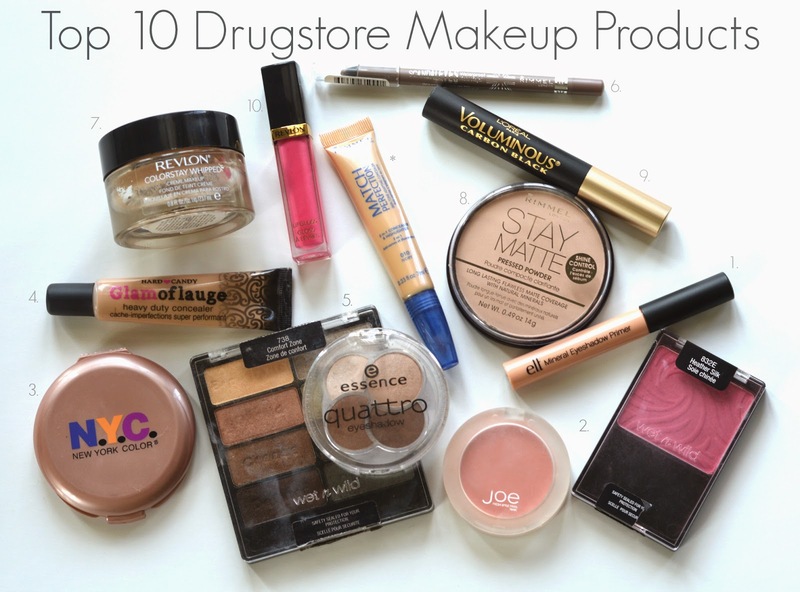 Now take this list to the drugstore and see the results for yourself!